Why do you need a boundary survey or property survey? 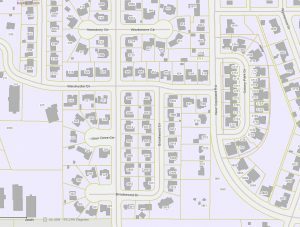 A boundary survey can determine if there are any easements you don’t know about for utilities such as water, sewer, drainage ways, power lines, etc. on your property. A property line survey identifies any encroachments like driveways, fences or buildings on the property or crossing any of your boundary lines. These encroachments can become permanent if you don’t handle them promptly. A boundary survey and drawing provide you the exact property line measurements and the precise locations of all structures (houses, barns, etc. ), fences, or driveways related to those property boundary lines. A property survey might determine if you are in a flood hazard area. Should you get flood insurance? We can advise you. A property line survey is the first step in being able to subdivide your property to divide it among family members. We show you the correct way to do this so you don’t end up with problems in the future. A property boundary survey should be done to make sure the building you’re constructing is on your lot, and not encroaching on any easement lines. A mistaken building location is an expensive problem to fix – ALWAYS. 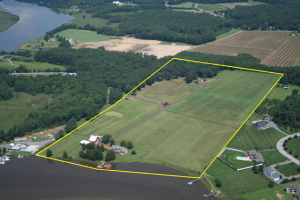 A boundary survey determines the location of property lines and the monuments that mark the property corners of a parcel of land as described in a deed. The land surveyor undertaking a property survey should examine the deed for the property as well as any adjoiner’s (neighbor’s) deed. Normally, if all the bearings and distances are relatively close to the deed calls then the land surveyor will accept the monuments found as representing the property corners. If there are significant differences, then more investigation must be done in order to determine the proper location for the corner. During the property boundary survey process, the land surveyor will also take into account the neighboring property deeds, and the long term acceptance of the corners found. Land Surveyors should make every effort to settle boundary issues found in the field and not create disputes which might lead to a courtroom. 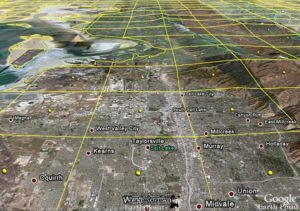 What is the cost of a boundary survey? The above factors can be reviewed prior to the survey beginning. The deed research is done first, and the land surveyor will not know how extensive this search is until they go to the courthouse and start trying to piece the deeds together. If the land owner has any deeds or abstracts these should be provided to the surveyor. This will somewhat reduce their research time but time may still have to be spent on adjoining deeds. Some parcels have passed through many owners over the years. Some may have added adjacent parcels or sold off portions of the original parcel. The more of these subtractions and additions that have been done, the more complex the deed research. Even with all of these variables, the land surveyor should, in most cases, be able to give you an estimate of the cost of the work. You’ll usually get this as a minimum amount, possibly with an upper Not To Exceed amount also given. You should have an agreement that no additional work should be done unless approved by both parties in writing. Money Saving Hint – gather all of the land information you can to furnish to the land surveyor. These items include deeds, tax maps, acreage, location of corners, and old surveys. These items will give the surveyor a head start on research and allow for a closer estimate of the property survey cost. What will I get when the boundary survey is complete? After the boundary survey is completed the land owner should expect that the boundary corners are marked or flagged in some way. Land Surveyors usually use either brightly colored surveyors ribbon or paint. There may also be a wooden stake placed beside the corner marker as a “witness” to the monument. If new or replacement corners were set, these are required to be marked with information that identifies the land surveyor who performed the work. If the landowner requested that the lines be marked at some interval then these markings would be in addition to the marks at the corners. Except in very rare circumstances, state law requires the preparation of a drawing. The survey drawing provides the landowner with a permanent record of the survey. If any of the monuments are lost they can be replaced with the information shown on the survey drawing. There are a number of minimum requirements for the survey drawing. One main requirement is that the survey drawing provide the legal description of the property. Other requirements can be found in the printed Minimum Standards of surveying for each state. For Texas, these can be found on the Texas Board of Professional Land Surveying website – General Rules of Procedures and Practices, or at Chapter 663 of Texas State Law. The land surveyors at ​Hideaway Land Surveying have been providing property line surveying services for over 30 years. We have experience in all types of land surveying. For more specific information about your particular survey in ​Hideaway, please call ​Hideaway Land Surveying at (903) 525-6405.